In this section you'll find the answers to frequently asked questions such as how do I login, how do I renew my membership, and other features of the website . We want this to work for you welcome any other questions you may have. Just drop us a line and let us know. 1. How do I login to the website for the first time? You must be an active member (meaning your annual dues are up to date) to login and have access to the "members-only" features of this website. 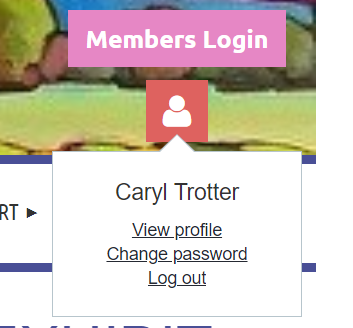 To login the first time, click on the Members Login button in the upper right corner of any page. Enter your email address and click on "Forgot Password". Within 5 minutes, you should receive an email with instructions for setting your password for the first time. You may also use this feature anytime you've forgotten your password. If you don't receive an email, check your "spam" or "junk" email folder and allow the sender. 2. Is there any action I should take after logging in for the first time? Yes. Return to the login button in the upper right corner, click on it, and select "View Profile." While we have made a concerted effort to import correct contact information, if you do see any errors, just select the "EDIT" button and make the appropriate changes. At the same time, review all other fields and make the desired entries. We encourage you to complete the volunteer section as we always are in need of more volunteers! Return to "My Profile"periodically to make sure your information is up-to-date. 3. Can I change the privacy settings in my profile so my contact information will not be viewed in the Member Directory? Yes. Log into your account and click View Profile. Then click the Privacy link. Click the Edit Profile button to enter the edit mode. From there you may choose who can view your personal information. If a lock icon appears beside a field, you cannot change the privacy setting for that field. Once you have finished changing your privacy settings click the Save button. 4. Why have I been assigned as a "Bundle Administrator" or a "Bundle Member?" A membership "bundle" is a collection of members (such as a couple or family) who are linked together and managed by one of their members called a "Bundle Administrator." This person is able to add up to four members to their bundle (i.e. a couple and their 2 children living at home.) This way the "bundle," or couple/family is only charged a single annual membership fee. The "bundle administrator" will receive the annual notifications of renewal fees. "Members" in bundles have not been assigned email addresses in the system, so please feel free to add that to your profile. That way all members of the bundle will receive regular e-blasts from CAC about classes, events, salons, and more. 5. Will everything about my membership be automated now? Yes! The Arts Center membership base has grown so large we found we needed a membership management software program to maintain it. You will now receive automated emails about your upcoming renewal dates, confirmations of classes you register for online, and regular e-blast notifications of upcoming salons, classes, events, house concerts, and other community arts happenings. 6. Am I required to pay my dues and class registrations with PayPal/ credit card, or can I still pay by personal check? While we encourage you to pay fees online via PayPal/credit card, you may still opt to write a check. When it's time to finalize payment select the "Pay Online" button to pay by PayPal/credit card, or select the "Invoice Me" button to pay by check or cash. Mail your check to CAC, PO Box 1802, Corrales, NM, 87048. 7. Can I view the invoices I've paid for dues, workshops, and shows? Yes. From your profile, select the "Invoices and Payments" heading. A record of your paid and unpaid invoices will appear. If you wish to pay an outstanding balance due via PayPal/credit card, click on the unpaid invoice and follow the check-out procedures. 8. The system does not recognize my email address. Why not? This means you are using an email address that differs from our records. Please contact us to correct this problem. 9. Do I always have to login to view the website? No. You only need to login to access "Members-only" features of our site - primarily the Members Directory. 10. Why have we changed our website? Our previous website served us well for several years. However, our site contained few interactive features. That meant tracking membership information manually resulting in many volunteer hours and increased propensity for errors. 11. What can I do to help make our new website a success? You can help by using the interactive features to join CAC, renew your membership, sign up for classes and workshops, and periodically review and update your profile. It would also be helpful for you to pay online via PayPal/credit card to become a member, renew your dues, and pay for classes and workshops. If you prefer this document is available as a pdf download here.